Captain Kumar Sangakkara top-scored with a brisk 75, while Mahela Jayawardene and Thilan Samaraweera also hit half-centuries, as Sri Lanka claimed the opening day's honours in the third and final Test against India, at the P Sara Oval in Colombo, on Tuesday. Thilan Samaraweera was unbeaten on 65 from 143 balls (6 fours) and Angelo Mathews was not out on 26, as Sri Lanka put up 293 for four in 86.5 overs in the first innings before play was called off early due to bad light. India dismissed both the openers in the first session after being asked to bowl for the third successive time by Sangakkara. Tillakaratne Dilshan (41) was run out at the stroke of lunch while Tharanga Paranavitana (8) became a victim of young pacer Ishant Sharma early in the innings. It could have been different for India had Raina, preffered over Yuvraj Singh, not dropped Sangakkara. Karnataka pacer Abhimanyu Mithun, bowling around the wicket, induced an edge which flew in the slip cordon straight to second slip VVS Laxman but Raina lunged on the chance from the left and in utter confusion the opportunity was lost. Dilshan smashed Ishant for two cracking boundaries and together with his captain raised a 87-run stand, which ended with a brilliant piece of work by Murali Vijay in the close fielding position. Dilshan pushed one off Pragyan Ojha and left his crease anticipating that Vijay, at silly point, would not be able to stop the ball. But a full stretched Vijay succeeded in clutching the ball threw it towards Dhoni, who took off the bails in no time and left Dilshan bamboozled. Kumar Sangakkara (75) hit Amit Mishra, who came in for injured Harbhajan Singh, for a four and a six to break the shackles. 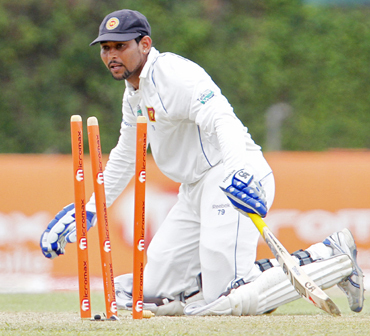 However, the Sri Lankan captain threw away the opportunity to score his third successive century. Sangakkara failed to hold the temptation of playing a big shot off Pragyan Ojha and holed out to Virender Sehwag at long-on to gift his wicket to the Indians. 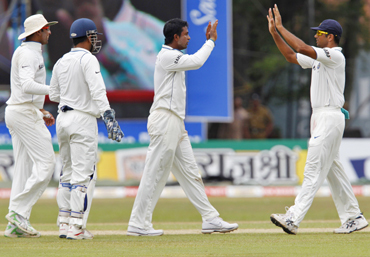 That was the only success for the Indians in the second session, in which Sri Lanka scored 92 runs in 29.3 overs. Sangakarra's knock came off 114 balls with two sixes and five fours and together with Mahela Jayawardene he collected 55 runs together for the third wicket. The young Indian bowling attack did a much better job, with the track being a little helpful in morning conditions. Ishant Sharma bowled fast, troubled batsmen and got the wicket of Paranavitana, who edged one to Dhoni behind the wicket as early as in the fourth over of the innings. Unlike the first two Tests, Ishant and Abhimanyu Mithun did succeed initially to contain the batsmen but once the Lankans got their eye in they were at their usual best. Pragyan Ojha though ensured India a double breakthrough, first having Sangakkara caught by Sehwag and then trapping the dangerous Mahela Jayawardene (56) in front of the wicket. Mahela Jayawardene (56) played the sheet anchor's role to perfection. 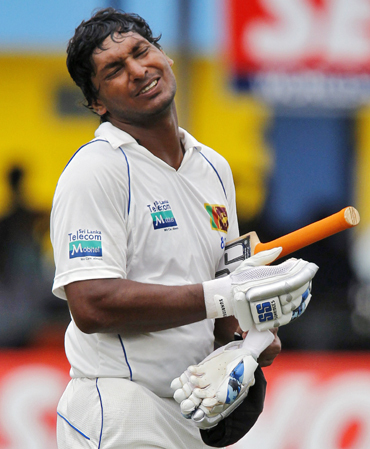 The former captain first helped incumbent Kumar Sangakkara (75) put on 55 runs for the third wicket. Then Jayawardene and Thilan Samaraweera put on a further 84 runs for the fourth wicket before the former was out leg before to Pragyan Ojha. 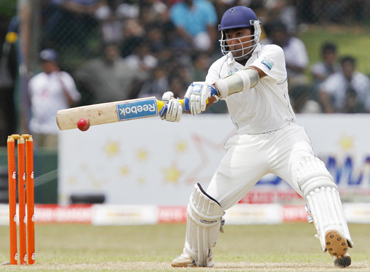 Jayawardene's patient 154-ball knock included just three hits to the fence.